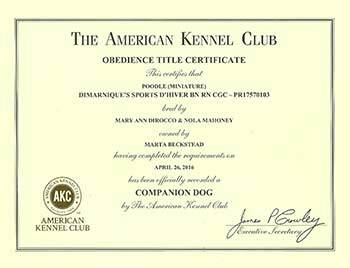 Here is Rio's URO2 certificate! 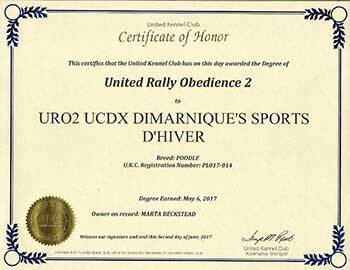 He earned his second level Rally title in UKC with three perfect scores, three first places and three rally High in Trials. 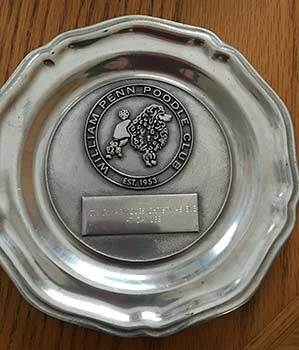 We are so proud of our boy! 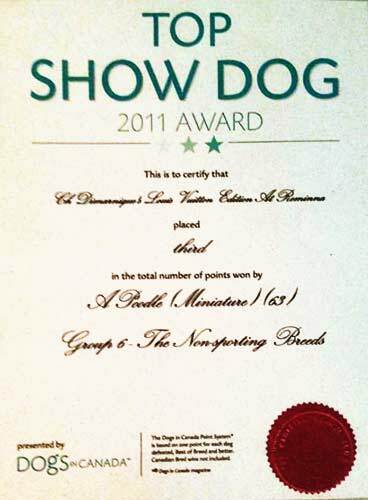 won his class 9-12 puppy dog class…. 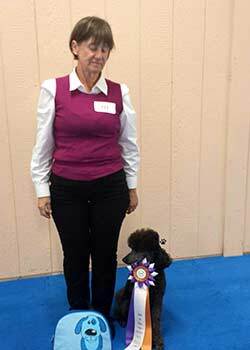 "CH DIMARNIQUES IN FLANDERS FIELDS"
"Rio and I went to the Obedience Training Class of Harrisburg UKC trials October 16, 2016. 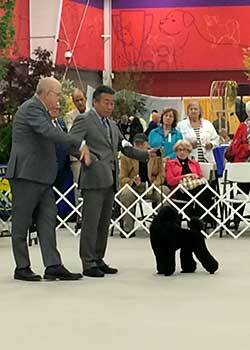 He finished his UCD with a score of 197.5 and was High in Trial. 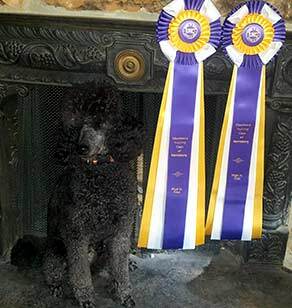 He moved up to the open class in the afternoon trial and earned his first leg toward his UCDX with a 195.5 and another High in Trial." Not only did he get the "CD" At PCA...he also got first place with with the highest Score. 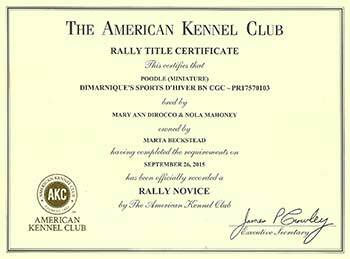 A big shout out & congrats to Marta for doing such a wonderful job with Rio! 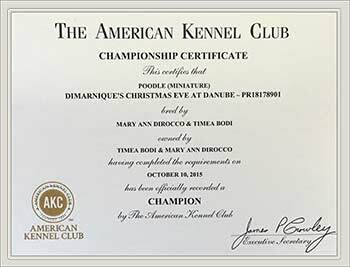 CH DiMarniques Christmas Eve At Danube aka "VIVI"
RIO, DiMarnique's Sports D’Hiver RN BN CGC, finished his first Rally Title on September 26, 2015 with 2 perfect scores of 100 & a 98 all in one weekend. 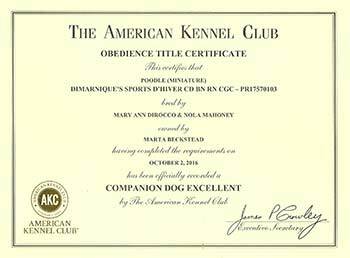 Thank You, Marta, for doing such a GREAT job with him!!! CONGRATS!!!! 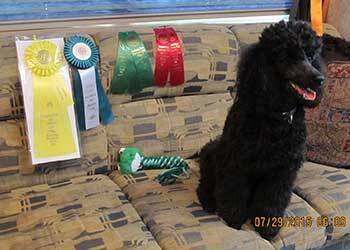 RIO got his Beginners Novice Title just a few weeks after he got his CGC Title. 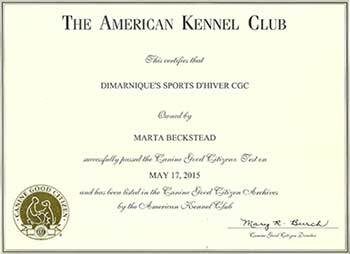 We are so proud of him and also very proud of his mother Marta, for working so hard with him!! 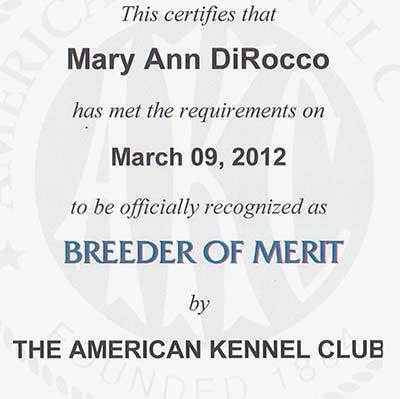 So a big shout out to Marta, too!! & We r so looking forward to see what's next!!?? 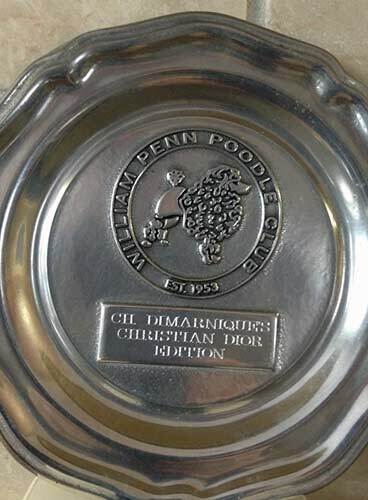 Pewter Plate awarded to me by the William Penn Poodle Club at our annual awards banquet (March 2015)...for breeding CH DiMarnique's Christian Dior Edition...aka..."Christian". 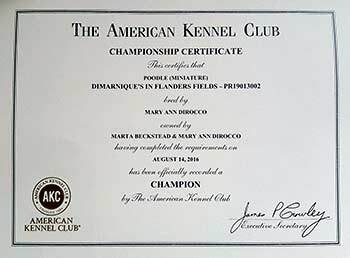 Christian finished his championship as a puppy in 2014...and finished UNDEFEATED!!!! 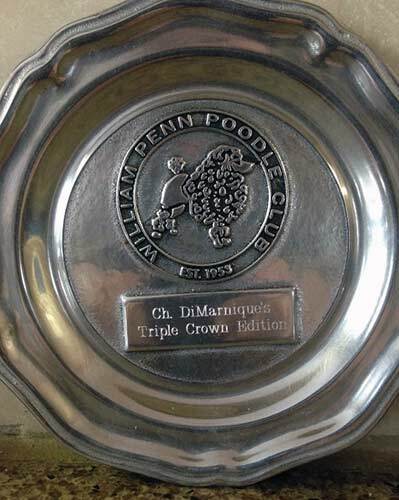 Pewter Plate awarded to me by The William Penn Poodle Club at our annual awards banquet for breeding CH DiMarniques Triple Crown Edition...aka "TC". 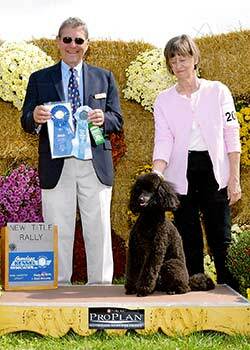 TC finished her championship as a puppy in 2013. 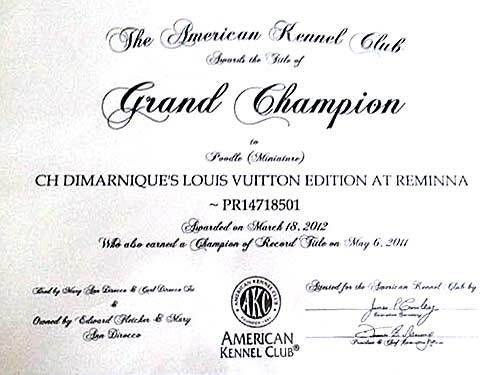 Another DiMarnique's Champion finished...CH DiMarnique's Christian Dior Edition, "Christian" finished as a puppy & undefeated!! We finished another champion...CH DiMarnique's Triple Crown Edition, "TC"
CONGRATS...to ZOE & her mom Judy...on her CGC TITLE. GOOD JOB to both of them! 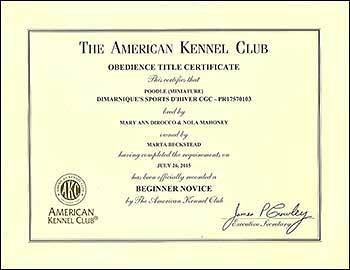 We finished 5 dogs which include 2 AM Champions, 2 AM/CAN Champions and one CAN Champion. 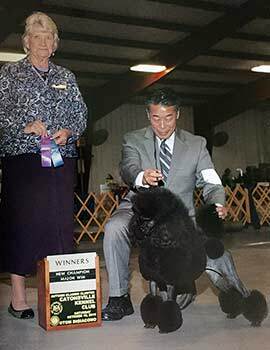 DiMarnique's was listed as one of the TOP POODLE BREEDERS FOR 2011 according to the AKC's records and acknowledged in Poodle Variety, Poodle Review and PCA's 2012 National Specialty Catalog. 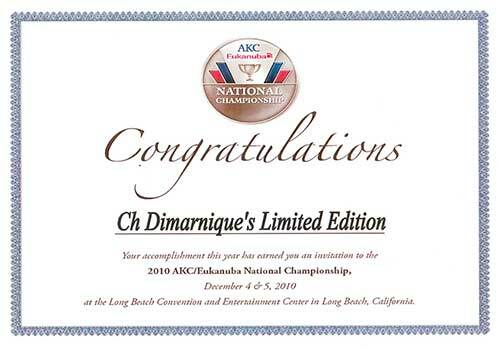 AM/CAN CH DiMarniques Limited Edition, "Dora"
AM/CAN Sanvars Bakers Chocolate DiMarniques TP, "Baker".